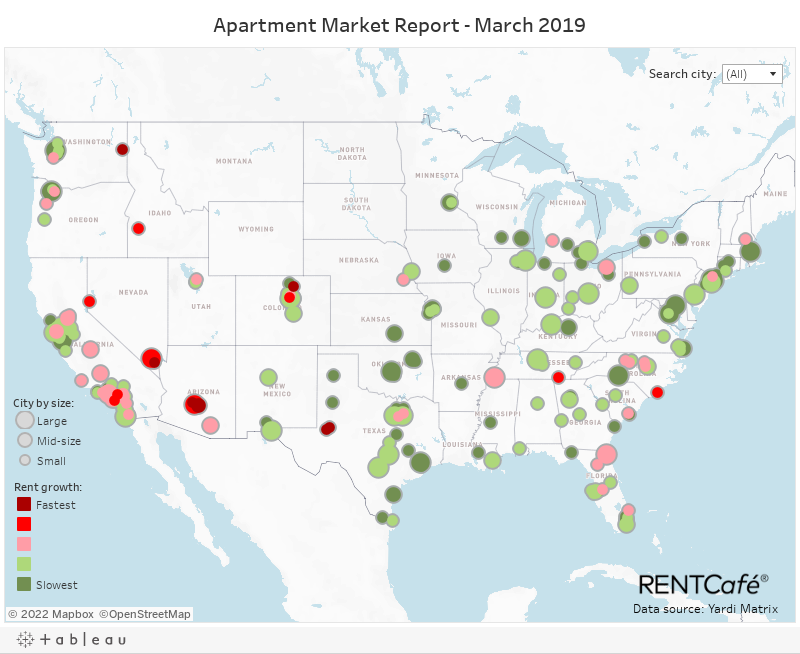 The national average rent was $1,430 in March 2019, 3.2% ($44) higher than this time last year, according to data from Yardi Matrix. 92% of the country’s largest 253 cities have seen rents grow in March year-over-year, 6% of rents remained unchanged, while 2% of cities experienced rent drops compared to 2018. The fastest and the slowest y-o-y rent changes occurred in small Texas cities — Midland (14.6%) and Odessa (13.3%) are the only cities with increases of over 10%, while Pearland is the only one where rent decreased by more than 2%. The early beginning of the rental season saw rent prices increase by 3.2% over the year — the lowest annual growth we’ve seen in more than 6 months. Compared to last year’s figure, the March average national rent of $1,430/month is $44 higher. Month-over-month, however, we witnessed a 0.3% rise, or $4 more added to average rent prices. This is consistent to last spring’s growth levels, signaling the end of the sluggish winter season. Small cities top both ends of the list of y-o-y rent changes in the U.S. The most significant year-over-year changes in March 2019 were experienced in small cities across the country. In terms of highest annual rent increases, the national scene is dominated by small cities, with Mesa, AZ the only mid-sized exception. Midland, TX and Odessa, TX continue to reign supreme with increases of 14.6% and 13.3%, respectively. Chandler, AZ, Mesa, AZ, and Henderson, NV are the only other cities to boast annual rent increases of over 9%. At the opposite end of the list are small U.S. cities that registered the slowest rent changes, such as Texas’s Pearland (-2.3%), followed by Santa Rosa, CA and Pembroke Pines, FL (both with a -1.4 decrease). Among the largest renter hubs, Phoenix, AZ and Las Vegas, NV boast the sharpest increase over the past year, 7.8%. This increase translates into $1,037/month for rent in Phoenix and $1,055 in Sin City. Los Angeles, CA saw $130 added to the average rent ($2,469), followed by smaller yearly net increases in Brooklyn, NY ($88) and San Diego, CA ($81). Rents in the NYC borough of Brooklyn reached $2,860 in March, while apartments in America’s Finest City rent for $2,155 per month, on average. Rent in Houston, TX is $1,098 after witnessing the smallest net growth among larger hubs – 0.9%, which is $10 more compared to last March. Reaching $919/month, rent in Columbus, OH is $32 above last year’s average, while renting in Indianapolis, IN ($857/month) is $33 more expensive than a year ago. Doug Ressler, Director of Business Intelligence at Yardi Matrix, sees the appeal large cities have for renters, despite rent increases. A majority of the robust cities are being driven by some combination of tourism, recreation, and the attraction of lifestyle amenities. However, each of these communities has developed a unique niche within these categories for their regions while staying focused on economic diversification, Ressler said. It has become critical for any metropolitan area today to capitalize on location advantages or other attributes, such as the presence of a research university or technical intelligence centers, in order to gain economic diversification growth. Aggressive increases in the Southwest have kept Phoenix and Las Vegas at the top of the list when it comes to rent growth in the past year, 7.8%, which translates into $75 and $76 more per month, respectively. Apartments in Jacksonville, FL come in third with a 6.3% ($64) increase accounting for a monthly average rent of $1,074. LA, where the average rent price is $2,469 following a 5.6% increase that means $130 more per month. Apartments in Memphis, TN now go for $39 more than in March 2018: $790/month after a 5.2% increase. It’s important to note that, compared to this time last year, San Francisco, CA had the highest net increase among large cities – the average rent of $3,619 means new renters would have to pay $153 more than what they would’ve 12 months ago. The weakest increases happened in Houston, TX(0.9%), followed by Manhattan and Portland, OR, both witnessing a 1.6% y-o-y increase. Rents in Queens reached $2,268 after a 1.8% y-o-y increase, and Boston, MA saw a 2% increase compared to last year, which brought the average rent price here to $3,343. Its proximity to Phoenix might contribute to why, with a 9.3% growth, the average monthly rent in Mesa, AZ of $1,009 has seen the sharpest year-over-year increase among mid-sized cities. At the same time, the city had the weakest month-over-month change, -0.2% (the same as Pittsburgh, PA, where the average rent is $1,209). When it comes to mid-sized cities, Oakland, CA saw the second-fastest y-o-y increase at 6.7%, getting the average rent to $2,793/month. In Riverside, CA, apartment prices registered a 6.4% increase reaching $1,540. Two mid-sized cities in California and Arizona are in fourth and fifth place for highest annual increases: rent in Fresno, CA is $1,060, while in Tucson, AZ is $857 following 6.2% increases over the year. In the top mid-sized cities that had the slowest increases, year-over-year rent prices lag well below 3%. Apartments in Wichita, KS go for $645/month after a 1.9% y-o-y increase, followed by apartments in Lexington, KY, with an average of $899/month after a modest 2% increase. Kansas City, MO ($982) and Tulsa, OK ($687) saw the third-slowest yearly growth after both had a 2.1% rise in average rent prices compared to March 2018. Rent in Corpus Christi, TX averaged $973 with a 2.4% increase over the year. Except for Mesa, AZ, the fastest yearly rent increases happened in small cities. Midland, TX (14.6%) and Odessa, TX (13.3%) are the only cities in the country to see yearly increases of over 10%. As a result, the average rent in the two Texas cities reached $1,609 and $1,418, respectively. Compared to last March, renters in Midland pay an extra $205 for the average rent, whereas those in Odessa pay an extra $167 per month. Chandler, AZ registered the third-fastest rent growth among small cities with 9.5%, meaning the average rent in the prominent Phoenix suburb reached $1,285 in March. Next up is Henderson, NV with an annual 9% increase accounting for its $1,264/month average, followed by Glendale, AZ where the 8.8% increase means that the average rent price is now $952. Out of 253 cities, only seven saw yearly rent changes below 0% — and they are all small cities that include Pearland, TX (-2.3%), Santa Rosa, CA (-1.4%), Pembroke Pines, FL (also -1.4%), Edison, NJ (-1.1%), Baton Rouge, LA (-1%), College Station, TX (-0.7%), and Stamford, CT (-0.3%). The top 10 most expensive and least expensive average rent prices in the U.S.
To no one’s surprise, Manhattan continues to have the most expensive average rent ($4,141), followed by San Francisco, CA ($3,619). The national Top 10 most expensive cities remained the same for March, which means Boston, MA maintains its third spot with a $3,343 average, followed by San Mateo, CA ($3,229) and Cambridge, MA ($3,052), while rent prices in the rest of the Top 10 are all below $3,000/month. The least expensive rent prices are all in the South and Midwest. Wichita has been leading as the most affordable city for quite a while and, in March, the average rent in Kansas’s largest city reached $645. Tulsa, OK boasts the second-most affordable rent in the country at $687. The rest of the least expensive rent prices remain in the $700 range per month in cities like Brownsville, TX ($707), Toledo, OH ($715), Killeen, TX ($731), or Oklahoma City, OK ($755). RENTCafe is a nationwide apartment search website that enables renters to easily find apartments and houses for rent throughout the United States. To compile this report, RENTCafe’s research team analyzed rent data across the 253 largest cities in the US. The report is exclusively based on apartment data related to buildings containing 50 or more units. Our report includes cities with populations over 100,000 and a rental stock of at least 2,900 apartments in 50+ unit buildings. In this report, large cities are cities with a population of 600,000 people or more, mid-sized cities are cities with a population between 300,000 and 600,000, and small cities are cities with a population of less than 300,000. Rent data was provided by Yardi Matrix, a business development and asset management tool for brokers, sponsors, banks and equity sources underwriting investments in the multifamily, office, industrial and self-storage sectors. Rental rate coverage is for Market Rate properties only. Fully Affordable properties are not included in the Yardi Matrix rental surveys and are not reported in rental rate averages. Starting with the January 2017 rent survey, Yardi Matrix is using a methodology that incorporates more properties into the sample which caused slight changes in overall rents and year-over-year changes compared to the previous reports. We expect this methodology adjustment to produce more accurate averages at the national and metro levels. *National averages include over 130 markets across the U.S., as reported by Yardi Matrix. We encourage you and freely grant you permission to reuse, host, or repost the images in this article. When doing so, we only ask that you kindly attribute the authors by linking to RENTCafe.com or this page, so that your readers can learn more about this project, the research behind it and its methodology.For more in-depth, customized data, please contact us at media@rentcafe.com. With a background in microtraining and e-learning content writing, Alexandra is a creative writer for RENTCafé, who now enjoys writing about rental lifestyle and residential real estate market trends. You can get in touch with Alexandra via email.